you tired to win the maps with a big advantage, to win always against the rookies on this random maps, you will find out how good you are really? 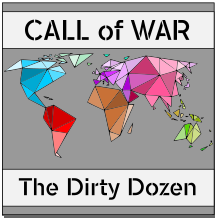 The Dirty Dozen is a series of games launched by CoW Support. Every month start a new game, four months lasts one season. The common thread in the league is the ban on the use of gold. This ban is monitored by the support and punished by the game play. You are interested to fight with us in the March round? Click here and follow the link to the rules and sign up!